WONDERFUL HOTEL !!!! ... I have just stayed at the Del Prado Inn for 3 nights during a Christmas holiday in Cusco and I enjoyed very very much. 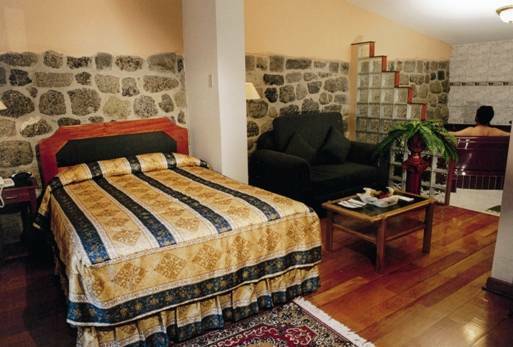 Location is wonderfu- just a corner from Plaza de Armas-l, staff is absolutely great and the rooms are very confortable. Steps away from tourist attractions, 10 feet from the Main square of the city of Cuzco - Peru (Capital of the INCA Empire), a walk away from ancient ruins, with Inca ruins inside our own location, built on a 17th century property, with all the modern comforts of life, Cable TV, Mini-Bars, Room safes, Telephone in the bedroom & bathroom, Jacuzzi, Electronic Locks, room service, etc. All personnel are college graduates on tourism an Hotel specialties, fluent on English, French, German. Del Prado Inn is a new concept in deluxe accommodations in Cuzco, our rooms count with the same elements that can be found in major deluxe hotel chains, each room has custom made furniture out of fine woods, deluxe wood floors, central heating, electronic locks, telephones in the bedroom and bathroom, bath tub and shower, high quality mattresses, clock-radio, room service, wake-up call, laundry and room safes; some of our rooms have a Jacuzzi and some others have balconies to the main plaza, breakfast is included. Without any doubt, we are capable of providing our guests with a very comfortable stay and total satisfaction, which will make them, come back and recommend our facilities. Our facilities count with elevator, fax service, safe deposit box at front desk, close circuit TV in the common areas for added security, international and local cuisine, and all our employees are professionals graduated in Hotel and Tourism specialties, all of them fluent in at least one foreign language. We started this service to the international and domestic traveler with the objective of elevating the quality of service to promote Cuzco as a destination, today we are associated to WorldRes, Bed And Breakfast SABRE and other international organizations, and soon will be working toward our ISO certification. 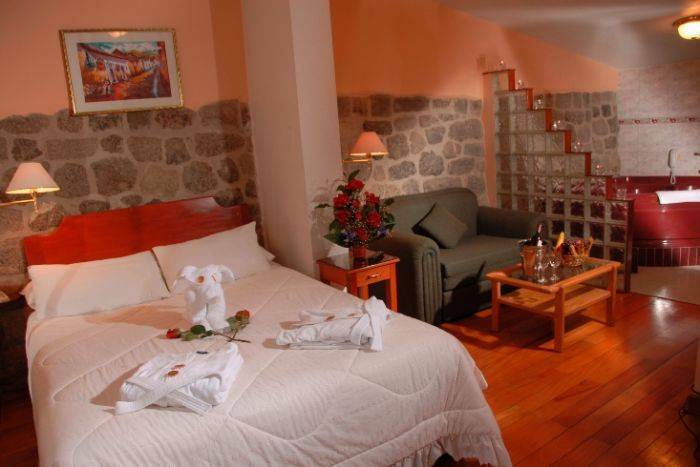 Del Prado Inn is a new concept in deluxe accommodation in Cusco. Our rooms offer the same and comfort found in major deluxe hotels around the world, each room is furnished with custom furniture made from fine wood, elegant wooden floors, central heating, electronic door access locks, telephones in the bedroom and bathroom, bathtub and shower, Plenty, of hot water 24 hours a day, luxurious and comfortable bedding, cable television, clock radio, room service, 24 hours concierge and laundry services, outlets for 110 & 220, in addition several rooms have an indoor Jacuzzi, while others enjoy balconies overlooking the main plaza. 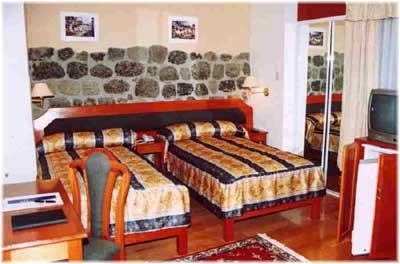 Del Prado inn is located in the heart of the city of Cuzco, steps from the Main Plaza (Plaza de Armas) and steps from main attractions. It is important to notice that we required passengers complete information in order to confirm the reserves. If the cancellation is made with more than 7 days prior the arrival, we won't apply any penalty.
. We will honor late arrivals through next day if domestic flight (Lima/Cuzco) is cancel/delay due to weather. 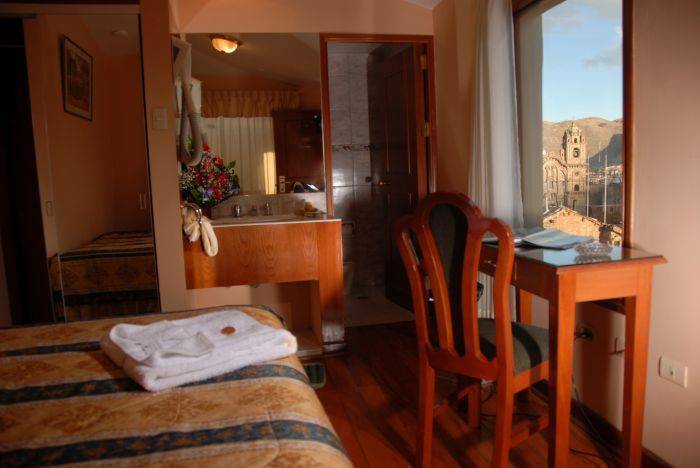 From Cusco Main square, take Uriel garcia (North Corner), walk few steps into Uriel Garcia, Hotel will found on your right hand. Request taxi driver to be taken to Uriel Garcia (Also Known as Suecia) right in the main square (Plaza de Armas). Nearest airport: Velazco Astete Airport. 10 minutes from the airport.